Best quality product from the house of Tulsi. These cashews come in box packing. Best quality Cashews vacuum packed to retain the optimum freshness. Cashews are naturally cholesterol free. Cashews are high in vitamin E, K, and B6 along with minerals. Storage information- Store in a cool and dry place. By buying this product you can collect up to 23 loyalty points. Your cart will total 23 loyalty points that can be converted into a voucher of ₹ 4.60. 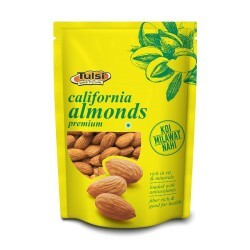 Tulsi Roasted Cashews Lightly Salted box is in creamy taste with many health benefits. These cashews come in box packing. These roasted cashews are our bestselling product relished by children and grownups alike. Best as a serving for cocktails, evening snack or anytime munch. Our Cashews are vacuum packed to retain the optimum freshness. Cashews are packed with vitamins, minerals, and antioxidants. These include vitamins E, K, and B6, along with minerals like copper, phosphorus, zinc, magnesium, iron, and selenium, all of which are important for maintaining good bodily function. They are rich in energy, antioxidants, minerals, and vitamins that are essential for health. Tulsi is a premium flavored nuts and dry fruits brand. Tulsi has pioneered a new and yummy way to consume the daily dose of healthy nuts and dryfruits. At Tulsi, we bring the taste and health together in a single pack in the finest of packing. We believe in serving the best products to our customers and hence we travel across the world to procure the finest nuts and dry fruits. Our products are processed and packed in FSSC: 22000 & HACCP certified plants – The best among food safety ratings and certified by ‘FSSAI‘.